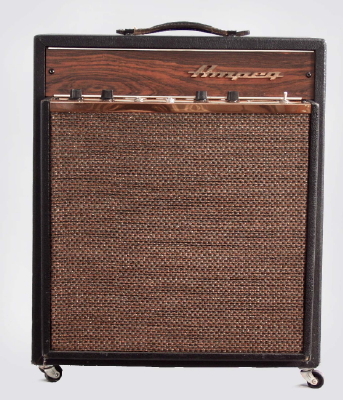 Ampeg Reverbojet J-12-R Model Tube Amplifier, c. 1968, made in Linden NJ, serial # 073383, black tolex covering finish. Height is 23 in. (58.4 cm. ), 19 in. (48.3 cm.) width, and 10 1/2 in. (26.7 cm.) deep. Very nice overall. All original and even includes the original vinyl cover. Not the quietest amp in the room, but a great swampy tone with a fantastic trem circuit. Excellent Condition.